Hey ya’ll. So you know those days weeks months when you have great intentions but everything is just so insanely busy that you don’t know which end is your head or your tail? Yeah. The old analogy of running around like a chicken with it’s head cut off… Here we are sitting in November, and I’ve been holding out on you. Because I have a secret… it’s this amazing book that I read that I want you to know about! But it’s more than that. It’s a deep breath of hope. Because if you’re like me, you have so much on your plate, and so many good intentions, but homeschooling gets shoved into a corner… and so do you. You might feel distraught or like you’ve let down your kids. If you have a gifted child and you’ve chosen been forced to homeschool because there just isn’t another option right now for your child, I definitely know how daunting it can be to approach every new day with confidence. Heck, it can be daunting to approach every new day. PERIOD. What is confidence??? So I’ve got a book that I want you to sit down and read over the holidays. It’s going to give you a jump start for a fabulous new 2016 with renewed HOPE for your homeschool experience!! It’s a book written by my friend, Alicia Michelle, whom I found through a mutual friend. You might remember me mentioning taking her Bloom class this summer before the school year started. 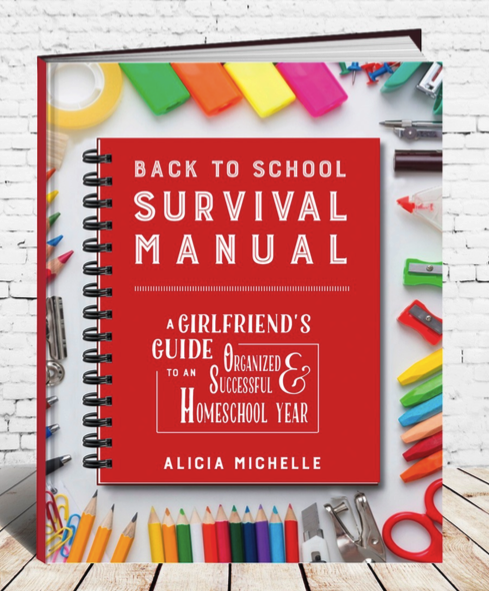 This book, her “Back to School Survival Manual,” was a PHENOMENAL encouragement to me, and really set us off on the right foot. It also gave me the HOPE to know that seriously, ya’ll, there are gonna be months like October. Where no blog posts get written. Where good intentions fall by the wayside. Where homeschool becomes unschool becomes no school at all… where mommy’s health and kids’ health becomes an issue that sends everyone to the couch for one more episode of Zaboomafu and Mickey Mouse Clubhouse. But by reading this book, I’ve been encouraged… and I have found HOPE! Perhaps my favorite line of the whole book is in the last chapter, but seriously, ya’ll, it sums up the last month of my life. 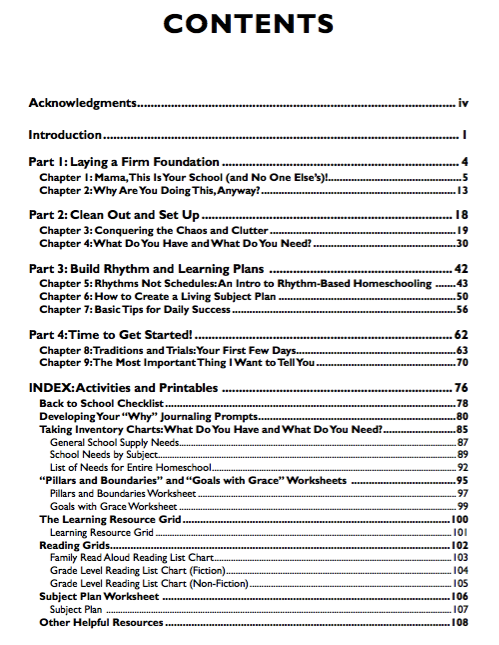 When I got to page 70, I was in the middle of feeling pretty useless as a homeschooler. I was feeling down. I was feeling like a failure. And then I read this. She goes on to give me hope that I CAN restart. I CAN apply pillars of time to organize a daily rhythm (like in Part 3). I CAN go back any time I want to Chapter 1 and revisit why I’m doing this. Homeschooling is NOT something we plan to do forever. But in the season we are in, it’s where we are. So, I need to carefully evaluate how I’m letting others’ opinions of homeschooling affect my own attitude toward what is a necessity at this point. I love her title on Chapter 1: “Mama This Is Your School (And Noone Else’s)!” I have to remind myself of that regularly. 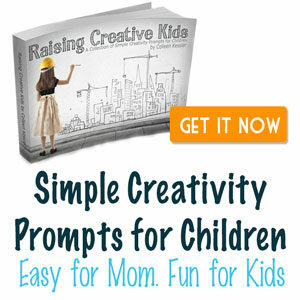 Truly, if you are a homeschooler who is new, or a homeschooler who has been around the blog block a bazillion years, this book it going to give you a deep breath of fresh air and HOPE to start your 2016. If you buy yourself anything for Christmas this year, make it be this book. Also looking for help with planning and flexibility? 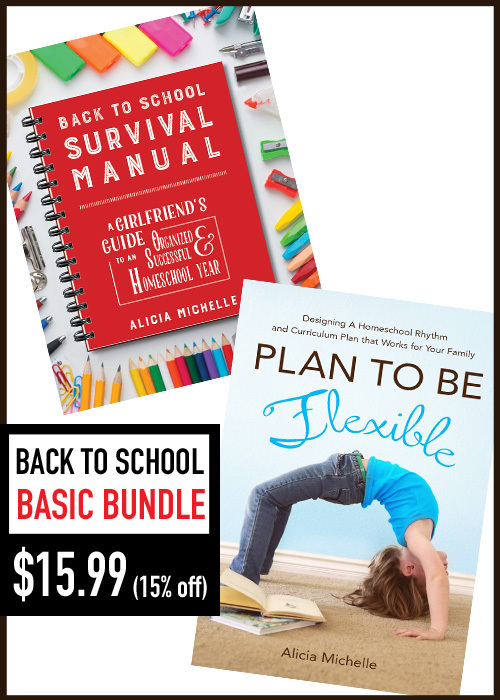 You might be more interested in her Back to School Bundle, where you’ll get the Back to School Survival Manual AND her book, Plan to Be Flexible! Because I keep sharing this story over and over with individuals, I decided I should just write it once and send out the link. So here goes. It all began on a summer day in June, of 2012. When baby girl Hinnant entered the world. We instantly fell in love with our miracle. Fast forward a few weeks, and we were desperately trying the 5 S’s to get her to sleep and still struggling. Enter the Graco Sweet Slumber Sound Machine (yes, that’s an affiliate link, and yes, if you have a baby and/or a child with sensory needs, you NEED one of these!!!). 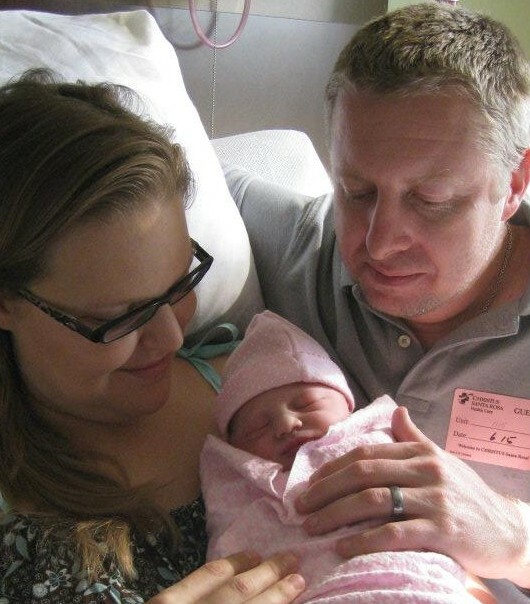 Amazingly, we started getting her to sleep… and sleep all night. Life was good. I honestly don’t remember exactly the moment when I realized she was gifted… and I don’t remember exactly the moment I realized she had Sensory Processing Disorder. It sort of was a coming to be… a realization that happened over time. Maybe it was speaking complete, comprehensible sentences at 13 months old. Maybe it was recognizing her colors at a year. Maybe it was her ability to sort and pattern objects before her second Christmas. Maybe it was her insatiable love of numbers and grouping them. Maybe it was her ability to work puzzles that said “2+ or 3+” at 18 months. But when she started adding numbers and then the next day subtracting them at 23 months, I knew something was definitely different. When she wanted to learn about fractions two weeks later, and then was comparing to see which fraction was bigger a couple weeks after that, I was positive. The SPD was a bit harder to discern at first. It seemed like crazy behavior. Like what sort of evil is in this child? And then I started really looking deep into her eyes and seeing not hatred or anger, but pain. Legitimate pain. I started researching and had a friend send me a survey to take that would pinpoint what areas she struggles with most. When I completed that survey, I knew it was true. So does putting a face on the “gifted” monster help? Does putting a face on the “SPD” monster help? YOU BET. Does it change how I parent? Not really. But in some ways it keeps me on my toes. I would still do fun enrichment activities with my kids and take them places and teach them how to cook and work puzzles with them and read them books. But realizing that she is gifted and realizing that she is learning at such a rapid rate – and much faster than normal, allows me to be willing to let her set the pace. To buy her a 100 piece floor puzzle and then work with her to put it together when she reaches frustration because her attention span isn’t quite as advanced as her brain. It has made me do more research about asynchronous development. Because I see it everyday. It’s very frustrating to be her parent. Because she can tell me how a shirt is made, but she can’t put one on or take one off by herself. She can sing me every song about the potty she has ever heard, but rarely can recognize her need to use it. She wants to learn how to tell time, and can count many different ways, but counting by 5s still evades her. I have learned to allow her a variety of sensory inputs, and to find ways to let her be who she is – in a safe and family/furniture-friendly way. Is it easy to be her parents? No. We often sit up at night and chat about her. We watch her on her video monitor, as she sleeps in her room with the light on and her bed full of stuffed animals and chews on her chew bracelets… and we listen for her cries over the sound of her sound machine, which she can’t live without. Truly, she can not sleep without it. Her crickets are vital in her life. They aren’t some passing fancy. Her brain truly can not shut down without hearing them. Rather than go on and on with these questions, please click over to my friend Colleen Kessler’s blog to these posts about the various types of gifted learners. I’m including links at the bottom of this page. Reading her posts helped me pinpoint exactly where Becca is in the gifted world, and they will help you, too! Her definitions of a gifted learner. Plus just be sure to check out her entire blog for lots more fascinating articles about gifted/intense/2E kids! Hey Baby Girl. 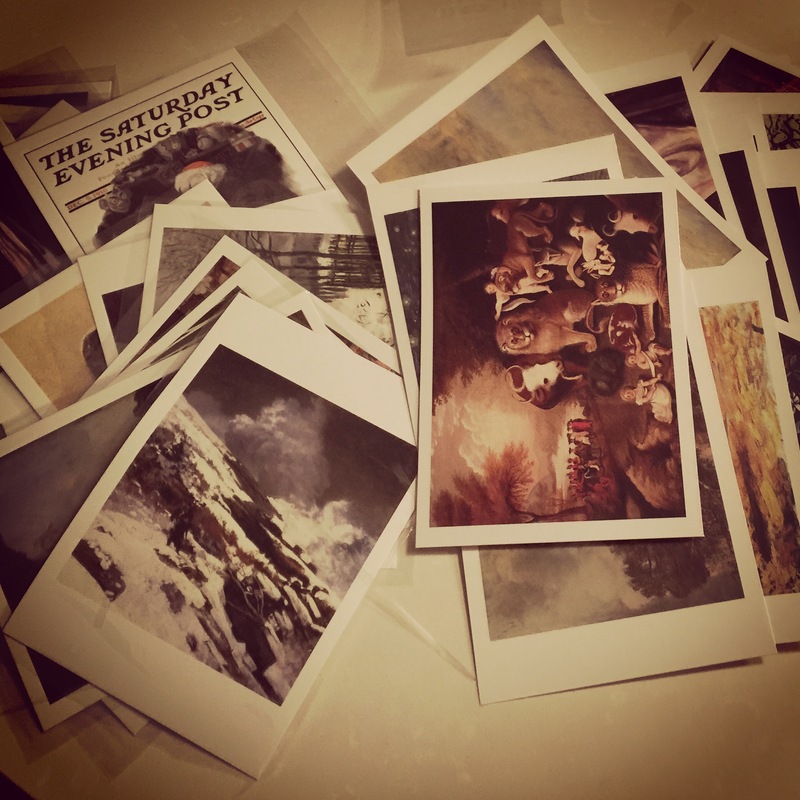 It’s been a while since I’ve written you a letter because, well, I’m so busy – with you! Tonight, though, as I sat at the bar and cut out laminating that we did today, I just had to stop and write to you. I never planned to homeschool you. I never planned to have a three year old who would actually enjoy looking at classic art work and discussing it with me. So as I sat there and trimmed around all these pieces of classic artwork, and day dreamed about all the conversations we’ll have, and the stories you’ll make up to go with each piece, and imagined all the cute things I know you’ll say while reflecting on them, I just had to stop cutting and tell you how amazing you are. I know that you struggle with some things. You get frustrated that you just can’t get the whole potty thing. You get frustrated that you can’t smell. You get frustrated because your letters don’t look like mine when you write. But baby girl, you are three. And you are amazing. God has given you a brain that never quits. Your thirst for knowledge is electrifying and exciting and makes me want to learn more, too. You make me want to be a better person. Yes, sometimes you frustrate me out of my mind and drive me to my knees, but even in those moments I am loving you, and in those moments you are sending me straight back to the One who created us both – and that makes me a better person. I love you. I love how you get big sad eyes and say that you don’t want us to leave you at bedtime. And I loved how tonight you admitted that it wasn’t that you were scared of your bed or didn’t want to sleep, but that yes, you really just wanted more time with us. Your love language is starting to shift. From being a child who solely relied on words of affirmation to get you through, now suddenly in just this last week you can’t get enough time with us. I’m sure part of it is because you are nervous about going to “school” in a couple weeks. You’ll never admit it, but I’m betting that two days a week away from home for Mother’s Day Out has you more than a little nervous. Baby girl, I’m terrified. I’m terrified that you’ll be yourself and that someone will break your heart because they’ll put you down for knowing all you know. I’m terrified that you’ll decide you need to be someone that you’re not in order to fit in with the status quo. I’m terrified that maybe you’ll be so enamored by your teacher there that you won’t want me to be your teacher any more. I’m terrified that this might be the only time I get to have someone else teach you until you’re in college. So I’m sure you’re more than a little nervous yourself. But Baby Girl, you’re the most amazing little girl ever. You have your challenges, and you have your talents. But the thing that makes you amazing is your spirit. It’s WHO YOU ARE. You are a child of the One True King. You are Rebecca Joy Hinnant. You are my baby. You are beautiful, and you have a heart of gold that cares so much for other people. You are my love. And while so many things about you have been nothing like I imagined, I am SO THANKFUL that you are EXACTLY who you are. Because God made you so perfectly. The things that the world might see as flaws, I see as a beautiful expression of God’s love. The things the world might see as abnormal or profound, I see as God’s way of making you exactly who He meant for you to be. You are amazing. And I can’t wait to see what this school year holds for us together. I look forward to analyzing classical artwork with you, and studying about our state, and learning more about numbers and doing experiments, and playing, playing, playing. You are amazing. And I love you forever. I would be remiss to not at least mention and say happy 15 months to my baby boy!! Where as the time gone!?!?! Has it really been 15 months since the day he was born?? I’m stuck. I’ve hit a wall. I have lots of things I want to write about to do with starting back to school. But the thing I need to write about keeps filling pages and yet doesn’t convey what I’m trying to say. The words are flowing, but they feel empty. They feel as lonely as the new little cemetery, sitting just a few feet from the fence line, marked with flowers already past their decomposition date. They feel as shallow as the grave- that Cody dug as deep as he could before hitting bedrock at only a foot. I just don’t really know what to say to explain who Boko was to me, or why my heart is still aching. Maybe it’s because he’s just always been there. Through practically day of the last seven plus years of my life. This morning I let Daisy out to go potty. When I came back to the door to let her in a few minutes later, I let her in and stood there for a long time, waiting for Boko to follow her. But he kept not coming. So, I stepped out on the porch with a sigh and clapped and yelled for him really loud. He still didn’t come. And then it hit me. He won’t be coming anymore when I call. He’s not here. 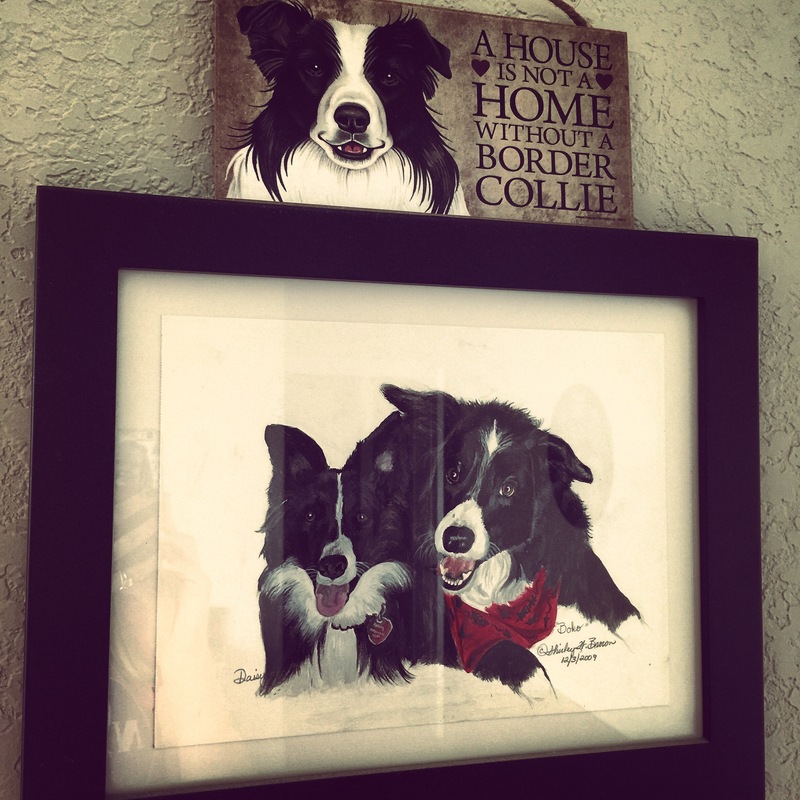 This is just one of about six blog posts I’ve started since having to have our sweet almost 17 yr old pup put to sleep last Thursday. I decided to just post it. Unfinished. Because I somehow need to move on. I love you, Boko. I’ll never forget you. Period. End of story. No more rambling. Because you know who you were to me. Keeping true to my word that this week will focus on our baby/toddler bees, I thought what better to talk about in my “From the Heart” post than the elephant in the room… Ya know, the big stinky thing that you can’t help but notice anytime you walk into the bathroom despite whatever fabulous brand of diaper pail/bucket/deodorizer/sanitizer/room freshener you own. The elephant… Aka the diaper. Be they cloth, plastic for swim, Pampers, Huggies, or good ole HEB brand, they have graced our home for over three years now. They started out small. Tiny. And actually kind of cute. And they have grown. With the children, who have also grown… But who are both still using them. We have used regular, night absorbancy, pull-ups, slip-ons, and yes, even the aforementioned cloth in attempt to contain the waste that continually seems to flow from both of our little treasure-to-trash composting systems. I’m not fond of diapers. It’s so much easier to just flush the waste away. The smell. The wiping. The diaper rashes. The smell. The constant use of diaper pail bags. The smell. Did I mention- the smell? I smell you again, I fear. Time to change has come once more. And when the shelf is empty, we’ll trudge back to the store. Can it really be that he’s already dirty? Can she really have been THAT squirty? I pray your end is so near!